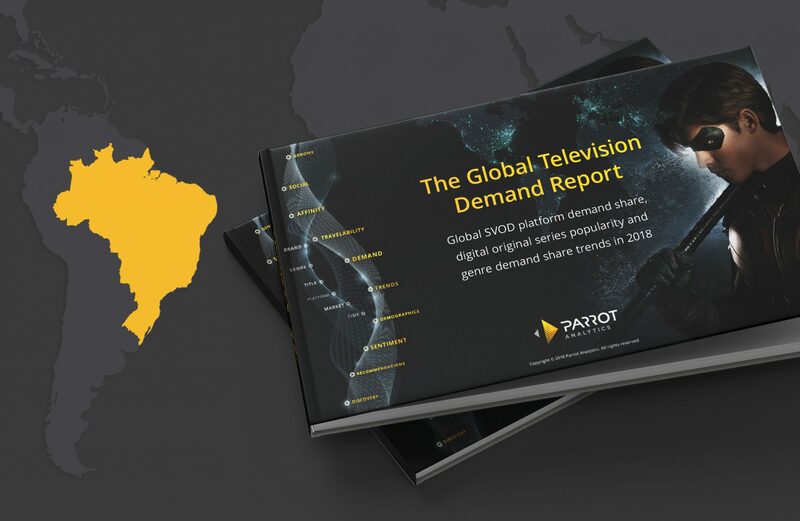 Parrot Analytics has recently taken an in-depth look at the market share of SVOD platforms in Brazil based on the Brazilian audience demand of each platform’s digital original productions. The SVOD market share report leverages Brazil demand data for streaming originals from Netflix, Amazon Prime Video, Hulu, CBS All Access, as well as local SVOD platforms. Please download the full 68 page report here, which also includes data and analysis for 9 other countries: Brazil SVOD Market Demand Report. In 2018, the majority (69%) of demand for digital original content in Brazil was for Netflix titles. Hulu and Prime Video both account for 10% of the demand share. 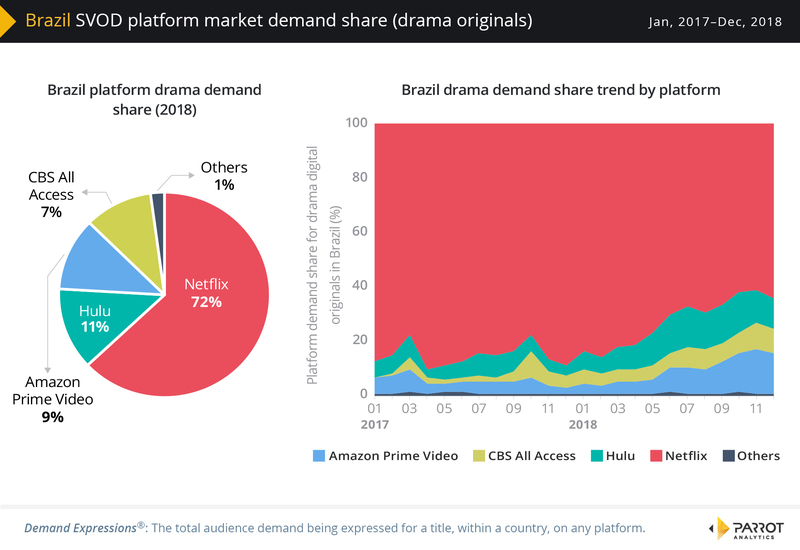 The change in Brazil’s platform demand share over time is swifter than in most markets, with the Netflix share decreasing by around 15% since the start of 2018. Netflix titles account for 72% of all demand expressed for digital original drama titles in Brazil in 2018. Hulu has the second largest demand share for drama titles in Brazil with 11%, while Prime Video has 9%. Competition for drama platform demand has accelerated in 2018 resulting in a decrease in Netflix’s share of drama digital originals to around 70%. 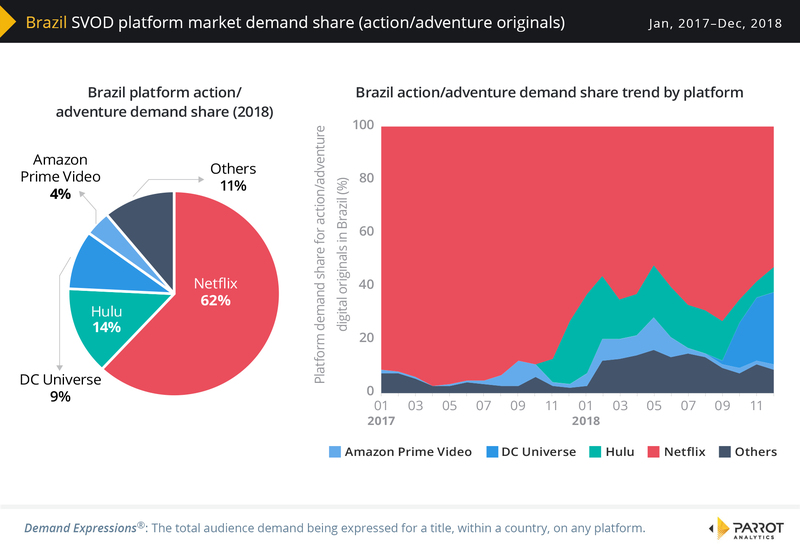 While Netflix has the largest Action and Adventure demand share in Brazil, at 62% it is the smallest share of all the markets in the report. Conversely, Brazil is the best market for Hulu action/adventure original titles, with a 14% demand share in 2018. DC Universe already has a 9% demand share in this market in 2018, despite only launching in mid-September 2018; its platform demand growth for action/adventure is evident in the 24 month trend chart. 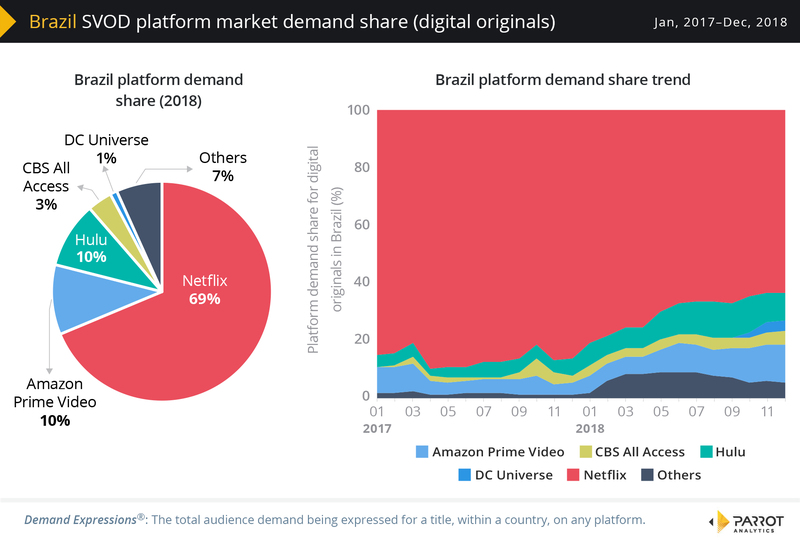 We reveal the 2018 Brazil SVOD market share of the major platforms including Netflix, Amazon Prime Video, Hulu and CBS All Access based on audience demand for each platform’s digital originals. Discover how SVOD market share trends in Brazil have changed over the last 24 months, including the contribution made by DC Universe. Learn where in the world content produced in Brazil is the most wanted relative to the Brazilian home market; we refer to this as content travelability. Discover which sub genres resonate the most with Brazilians compared to the global average. Find out what the demand distribution of a selection of digital originals in Brazil looks like. Discover the top 20 digital streaming shows in Brazil, as well as 5 additional titles of interest to audiences in Brazil. Discover the worldwide platform demand share of drama digital originals as well as the worldwide platform demand share of action/adventure digital originals. Note: This version of The Global TV Demand Report does not include any market share information for as yet unreleased SVOD platforms such as Apple TV+ and Disney+. Parrot Analytics publishes this report each quarter, be sure to bookmark https://insights.parrotanalytics.com/tv to gain access to the latest available market share report across all SVOD platforms. After reading this article you may have a few questions, such as “How can TV series and SVOD platforms generate demand in markets where they are not yet available?” Please make sure to read our methodology for demand attribution and also our knowledge base article on how Parrot Analytics defines a “digital original” series.